My husband will be 70 next year and we are researching our family history so that we can pass it on to our grandchildren. My husband was born in 1948, lived in Hulme and attended Holy Name School. He remembers being sent to a children's home for a short time, we think because his mum had gone into hospital for heart surgery, probably about 1953 or 54, he would be about 6 or 7. We have tried to find out about this, we have written to Manchester Social Services but they have no details. Could it possibly have been arranged by the church? He remembers it was in the countryside, there was a sports field with a cricket pavilion and an orchard nearby. We even have photos of him which he thinks were taken whilst he was there. Can anyone shed any light on this home? he would really like to know more. Thanks. Hi Linda53 welcome to the site, although a bit younger than your husband I too was sent to a home, as my Mother suffered post natal depression,this would be around 1955-56, all I know is that the home was in *Marple, think it was near the Roman Lakes. We lived on the Hulme/Moss Side border at the time, as my parents were non religious I doubt the church was involved. Another place Manchester children were sent to at the time was Dr Garrett Memorial Home in Conway, although I don't recall an orchard. Thanks so much, that is really useful. There is very little about Dr Garrett's Home, on the web, but he thinks it's probably not that one, although it provided just the right type of care (looking after children whose mothers were ill). The orchard I mentioned was probably no more than a few apple trees, and there was also a goat! He remembers it being a large house with a big front door and stone steps. He also remembers being looked after by nuns when he fell and banged his head, which would suggest connections to the church (his mum was Catholic), but you know how the years can colour your memories! Thanks so much for the photo, this looks like a definite possibility. The 1968 street directory lists St Gabriels Childrens Home "Knolle Park" next door to St Gabriels Convent at the Church Road end of Beaconsfield Road. Strawberry Field Childrens Home is at the other end, and Abbots Lea School was on the other side of the road, with Lower Lee Special School next door to Abbots Lea. 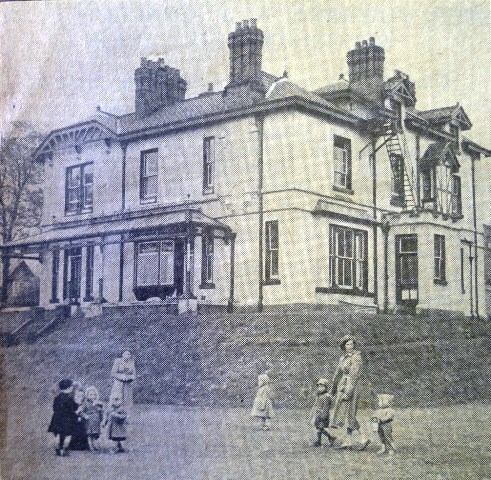 Knoll park Saint Gabriels Convent is now Knoll Park assisted Childrens home or something like that. The photos are of the gatehouse where lived while at the convent for 20 years yes, really and the main building entrance. Any old alter boys reading this?